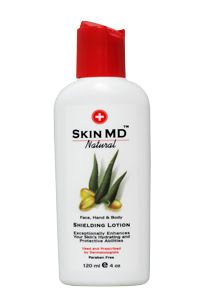 Before trying Skin MD Natural Shielding Lotion I will admit that I had never even heard the term "shielding lotion" before. What I found out is that shielding lotions are a new type of skin care product based on years of research into how skin heals. They form a protective shield with the outer layer of skin and help keep out irritants. They allow the natural oils and moisture to remain in the skin so it can heal better and they're light in texture so they go on without a greasy mess. Sounds good to me, no reason not to give it a try! What I found especially interesting about this product is that it is meant to be used everywhere on your body - face, hands, body and feet. Not a lot of lotions multitask to that extreme! It's not a huge bottle - 120ml - so I figured if I was using it all over it would be gone in a couple of weeks but you actually use such a small amount that after a couple of weeks I had still barely made a dent in it. I ended up concentrating it on my drier bits - so feet, knees, elbows and hands. I will admit that the lotion seemed so thin that I had a hard time believing that it would be of any moisturizing use but boy was I wrong! It goes on like nothing, it feels like nothing but its moisturizing abilities are something else! I will admit, although it did a fine moisturizing job on it's own, I ended up using it over my regular moisturizer because it lacks an important element to me - smell! It has no particular smell which I know to many of you is a good thing, but I do love my fruity body lotion smells! To be eligible for the draw, be in Canada or the US, you must join Beauty Crazed as a follower if you aren't one already. You can either do it through Google or through Networked Blogs on Facebook - you can find both signups on the right hand side of the Beauty Crazed site. Once you belong to our crazy family just visit the Skin MD Natural website here and leave a reply to this post letting us know you want in and tell us one of the ingredients mentioned on the top of the Skin MD homepage (here's a hint, the first one is aloe vera). Including an e-mail address would be extra helpful and you can write it like this - info(at)beautycrazed(dot)ca - so the bots can't find you but we can! Or if you prefer not to leave a public post, it's also fine to e-mail us - info@beautycrazed.ca, please put "Skin MD Contest" in the subject line. Winner to be decided by random drawing and you have until March 11th to enter. One of the ingredients mentioned is Tocopheryl Acetate (Vitamin E.
One of the ingredients is vitamin E. I am a follower and receive your blog on my gmail. Octinoxate which is commonly used in sunscreens. I want in. One of the listed ingredients is Tocopheryl Acetate (Vitamin E). I'm a follower on Google Friend. I follow via Google. I would love to try this product. One of the ingredients mentionned is Viatmin E.
I'm a google friend follower. Tocopheryl Acetate (Vitamin E)is a listed main ingredient. Would love to win!! I would like in and another ingredient is herbal extracts. I am already a follower. Another ingredient is Tocopheryl Acetate. And one of the ingredients is Comfrey. Comfrey is pretty amazing. My mother grows those leaves at her farm and you can basically rub it on your skin and it takes out toxins like metals and slivers and chemicals. I'm a follower (please follow me). Another ingredient is Vitamin E.
I'd love to win Skin MD Natural. One of the ingredients they mention at the top is Vitamin E for hands. I would like to be entered. Another ingredient is herbal extracts. I'm a follower. One of the ingredients listed is Vitamin E.
Do I need to say I want in? I forgot to say that on my first post. I follow you on Facebook Networked Blogs. One of the ingredients mentioned on the top of the Skin MD homepage is vitamin E. Please enter me into the contest. Thanks! I am a google follower. Please enter me. One ingrdient is Vitamin E.